Where can I see Arsenal on TV? The obvious talking point here is that we came back from 1-0 down and won 3-1. This was as complete a reversal as I have seen: from the worst 1st half I have seen since we played Sheffield United on a peat bog during what looked like World War 1, to a second half in which we played the kind of commanding football that Arsenal are supposedly known for but which we only seem to be able to do in spurts. No, that talking point is too easy. Huzzah to Arsenal, you pulled your collective heads out of your asses. The question for me is given the Boss’ very public concerns for Theo being overused was it a good to bring him in? On the one hand I say no: Theo cannot play every single game. Especially since it’s quite clear that we are going to need him to stay competitive and that means we are going to need a 100% healthy Theo when we face top teams like Chelsea, Liverpool, Man U and Hull City. On the other hand, this game has to be a huge boost for Theo. He now knows more than ever that he has the ability to take over and pretty much single-handedly win a game for Arsenal. This is a major boost to Theo’s confidence and understanding of the game. For that reason and that reason only I’m giving this to Theo in the “good” category. Also showing some real quality was Mikel Sylvestre. He wasn’t the flashiest player on the pitch, but he was 100% committed and more than anyone else in an Arsenal strip willing to put himself about in order to win the ball. 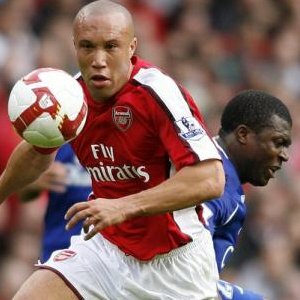 He is the type of no-nonsense defender that I haven’t seen at Arsenal since Sol Campbell. Rather than play the ball out of the defense like we have grown accustomed to, he is more than willing to just hoof the ball out. I know that this often just returns possession to the opposition and I know that Wenger’s game is predicated on keeping possession, but I have to say that I felt so much more assured when Mikel hoofed the ball out than when Song tried to dribble the ball out. In some ways, Mikel is exactly the kind of defender that a lot of us have been asking for. Sure, it’s just one game in and I can see where he might make some mistakes, but all our defenders are prone to mistakes so given that it’s a breath of fresh air to have such a straightforward, 100% committed defender on the team. Likewise Samir Nasri is a hurricane of fresh air (mixed metaphor!) compared to that bloated, farty, self-important, gassbag Alex Hleb. Nasri provides width to this team, which Hleb and his insistence on dribbling into the middle could not and Nasri, and I know that you all think I over value this, also has the ability to score goals which Hleb did not. In 4 games Nasri has as many goals as Hleb had in 29 games last season. What was Arsene thinking playing Eboue on the right wing and Song as right back? After the match Wenger admitted that it was strange and said that he wanted Eboue to bring some “defensiveness” to the right wing. Well, that didn’t work, because it was the right side that was opened up for Leon Osman to traipse into the Arsenal box, past a sauntering Denilson and score a ho hum goal. I don’t know what sort of magnificent player Wenger thinks Song is bit I’d rather that Song not be used in that sort of formation again. Also bad is that Toure picked up a shoulder ligament “twist” and Samir Nasri may have picked up a thigh injury. Kolo is currently being ruled out of the Fener clash on Tuesday and Nasri is listed as day-to-day. That leaves Arsenal with really no choice but to field Sylvestre and Song in the back, Diaby on the wing, and Theo on the other wing. Not the ideal situation really. There are some reports that Djourou might be healthy for the trip to Turkey, fingers crossed that’s the case. Denilson deserves particular mention here because he wasn’t even really trying until after Theo came on. More than any other player I credit him with Osman’s goal, that was his marker. Watch the video (over at the Arsenalist, of course) Osman beats Denilson and he just walks back into defense. Maybe, MAYBE, communication was an issue. If you watch, he throws his hands up as if to say that it wasn’t his fault, so maybe someone called him off Osman. I’m not sure. All I know is that he walked back into the defense. If you want to be Arsenal’s defensive midfielder you have to have a much better sense of defense and much more commitment than that. And finally, both Theo and Cesc are reportedly in contract negotiations and the press is having a field day. There was a news story started by News of the World that Cesc Fabregas is rejecting a massive contract offer from Arsenal. To his credit, Cesc immediately denied the reports but for me this is what you get when you make public statements like he did earlier in the week. On the other side of the coin, Theo is reportedly delaying contract negotiations with the club as well. Right now, I trust that Theo has his head on straight about this issue, after all he’s said as much in countless interviews. We’ll have to wait and see, January could get really ugly for Arsenal supporters. That’s it for today, I’m going to go have a kickaround, drink some beer, and then my old lady is going to make me a roast dinner and pecan pie. It’s my birthday after all! Now you’re just Riberying me. If you’re going to lie, lie big.